How Sesame Street charmed the world Jump to media player From the Bronx to Bangladesh, half a century on, the impact of the playful puppets has spread far and wide. Meet Sesame Street's latest puppet Jump to media player Zeerak, 4, joins his older sister Zari on the Afghan version of the popular children's TV show. Meet the masters behind the Avenue Q puppets Jump to media player Avenue Q puppet coach Nigel Plaskitt passes on his puppeteering skills to young actors. Sesame Street's first autistic puppet Jump to media player Big Bird tries to interact with Julia in her TV debut. BBC newsreader excited to meet Elmo Jump to media player The Sesame Street character is visiting Singapore with a message about kindness. Has Sesame Street been gentrified? Jump to media player Sesame Street's Elmo explains why his neighbourhood seems to have gone upmarket. Sesame Street Count on More or Less Jump to media player More or Less presenter Tim Harford talks to Sesame Street's resident number expert Count von Count. 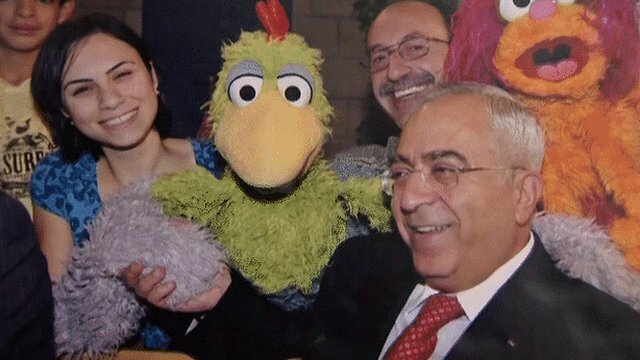 Palestinian Sesame Street halted Jump to media player A decision by the US Congress to suspend the transfer of $200m (£130m) worth of aid for Palestinian development projects has put the Palestinian version of Sesame Street on hold. 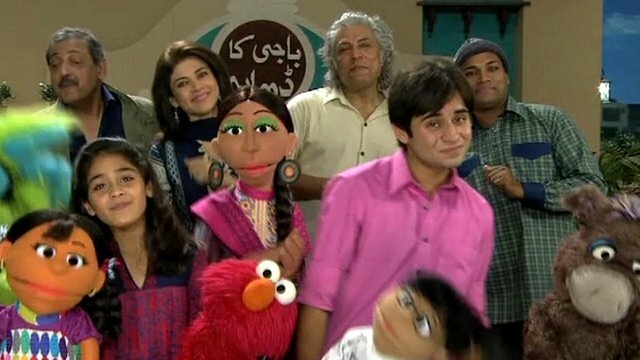 Sesame Street comes to Pakistan Jump to media player Children in Pakistan are about to be introduced to the US television favourite of Sesame Street. Sesame Street is 50 years old. From the Bronx to Bangladesh, the impact of the playful puppets of Sesame Street has spread far and wide over that time. The BBC's Laura Trevelyan hangs out with Elmo and Abby in New York, and asks Sherrie Westin of the Sesame Workshop the secret to the show's longevity.